On Monday, Oct. 24, 2016, Rails-to-Trails Conservancy (RTC) took to the Capital Crescent Trail for a celebratory cleanup in honor of our nation’s 25th Make a Difference Day. Officially recognized on the fourth Saturday each October, this annual day of service unites volunteers across the country to help improve the lives of others. Team RTC answered this call to service by doing what we do best: improving a trail to better serve its community! The 11-mile Capital Crescent Trail stretches from Silver Spring, Maryland, to the heart of the historic Georgetown neighborhood in Washington, D.C., and serves as a popular commuter pathway (used by an average of 18,000 users weekly). In addition to taking trail users alongside several iconic sites, urban centers, the Potomac River and the Chesapeake & Ohio Canal National Historical Park towpath, the trail connects to Rock Creek Park, adding another 11 miles to its length. In the spirit of giving back, we descended on our local trail with trash bags, tools to remove weeds, gloves and can-do attitudes. 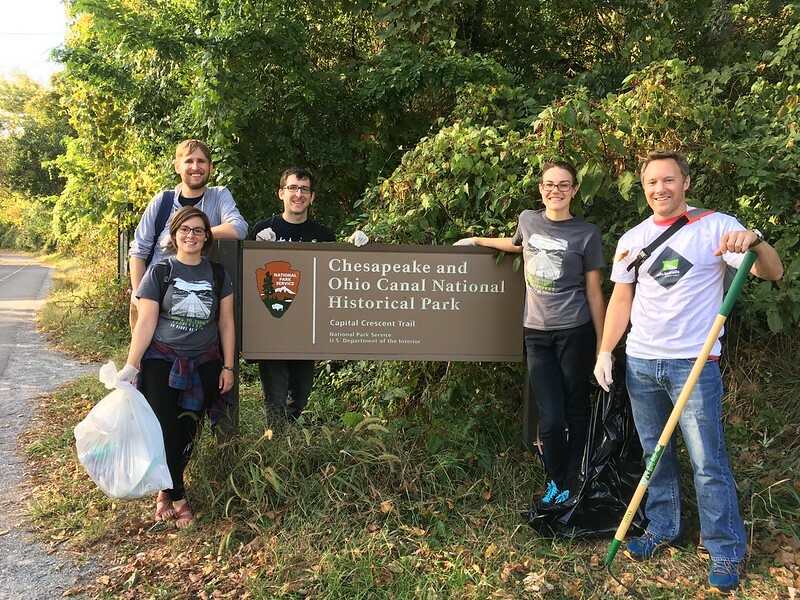 Although the team would have loved to clean up the full 22 miles, we decided to focus our efforts along the Georgetown section of the trail; we even put together a slideshow for you to see us at work! By the end of the day, team RTC, along with one of our amazing members from the D.C. area, John Ellicott, successfully removed two jumbo bags of trash from the Capital Crescent Trail. Make a Difference Day mission accomplished! Our service project was smaller in scale, but we hope you will help us—and the many other incredible trail volunteers out there on Make a Difference Day—amplify its impact by getting outside and improving your local trail! And if you can’t make it out to a trail, you can always make a difference by supporting Rails-to-Trails Conservancy’s work to create networks of trails nationwide.